Bermuda is still lagging behind the rest of the world when it comes to broadband internet speeds. 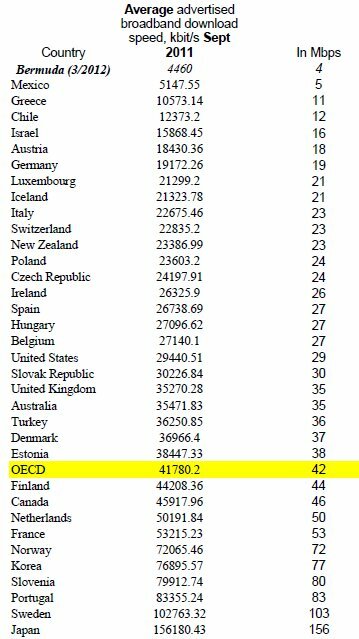 The latest figures released by the Organisation for Economic Co-operation and Development (OECD) for average advertised residential broadband download speeds makes depressing reading. Nice to see local companies finally starting to use social media effectively (ie. something more than sticking up a Facebook page and losing interest in posting anything after a few weeks). On the weekend, I updated the iOS software on my iPhone … which proceeded to wipe out the APN details (this is the address that enables your phone to connect to your carrier’s cellular data network so you download email, access the net, etc.). I couldn’t remember what the details were for CellOne and, after losing the will to live while on hold for their customer service (it kept telling me my call was first in line … for about 10 minutes), I simply asked for help on Twitter. Within a few minutes I got a message saying that CellOne was following me and shortly after, they sent me the details I needed. Now, my other Twitter friends beat them to it by a good 20 minutes, but CellOne deserves credit for not just having a Twitter account to appear cool and “in touch” but for actually setting it up to search for mentions of its company and monitoring it so that they can respond promptly to customer queries like mine. I know this sort of stuff is par for the course in the real world but it’s long overdue in Bermuda. So thanks, CellOne, for being on the ball with that little extra customer service. Other Bermuda businesses, take note. As someone involved in the media business, I was both interested and puzzled by some of the statements from the new Publishing Division of the Chamber of Commerce, announced this week. The division said its priority was to restrict publishers of foreign-produced Bermuda publications like Fast Track,, Bermuda Wedding & Honeymoon, and Destination Bermuda from selling advertising to local businesses. It also claims that local publishers do not get the chance to bid on publications like the Bermuda Airport Magazine, which is supported by the Ministry of Transport. Falling ad revenues and the disruptive influence of the internet mean these are extremely challenging times for all publishers but some of these comments struck me as either naive wishful thinking or smacked of unproductive head-in-the-sand protectionism. At the very least it appears to underestimate the nature of global competition that affects every business in Bermuda, while chastising local advertisers for supporting “overseas enterprises” is a bit rich coming from publishers that print virtually all of their magazines overseas and frequently employ overseas writers, editors, photographers, voiceover talent and designers. What’s good for the goose is apparently not good for the gander. Besides, many of these overseas magazines spend money on the island by hiring local writers, photographers, designers and sales people. And also don’t many of these publications directly benefit Bermuda in terms of exposure and promoting local businesses and services? The main reasons they do not print here are firstly because local printers can neither compete financially nor handle the large print runs required. Also, as the main distribution may take place in North America or elsewhere, it simply doesn’t make sense for them to use a Bermuda printer. It’s hard to see where the chamber’s argument leads. Apart from the work permit issue, what’s next – insist all “Bermuda” publications are printed here or face punitive import duty? Talk about turkeys voting for Christmas! And while we’re at it, what about ads produced by overseas agencies for local companies? Is the next step to insist local magazines only carry ads designed and produced locally? And by extension does the chamber think that local advertisers shouldn’t buy space on international websites? It is the ubiquity of an always-on Internet and mobile devices that are the real long-term threat to physical publications. Indeed, calling for tougher work permit restrictions on overseas sales people is likely to be ineffective as solicitation by email and phone is so easy. Opposing it is, as one colleague aptly put it, like using a cage as a fish tank. Outsourcing, technology and the global competition that comes with it are facts of life. Not everyone will successfully adapt and thrive in the face of relentless change but perhaps we should perhaps do a little less whinging and work harder to improve local products. Advertisers will support whatever product or platform best reaches their target market and local companies that think nothing of outsourcing their back office operations for the most couldn’t care less where that media come from. It seems to me that creativity and quality are our best chance of keeping more of those advertising dollars on-island, not heavy-handed, self-serving protectionism. Journalism is changing so fast these days that career advice about entering the business is becoming outdated and irrelevant. With print media seemingly struggling to survive and electronic media under pressure from the internet, “uber-blogger” Robert Scoble says would-be journos today need to be multi-tasking entrepreneurs and should look for options outside traditional media. MediaShift . Video: Robert Scoble on How to Build a Career in Media | PBS. The Atavist is an intriguing new take on digital publishing. Founded by two former Wired writers/editors, it aims to be a home for the type of long-form journalism that is disappearing fast as publications fold and the web fragments into social media and soundbites. Basically, Atavist produces original, in-depth articles that it offers like music tracks for iPad/iPhone, Kindle or Nook (Android versions are in the pipeline). Prices range from $1.99 for a text-and-photos version to $2.99 for a fully-loaded article with audiobook – you can switch between text and audio without losing your place – and other multimedia content and features. Atavist says it sees its articles as “a new genre of nonfiction, a digital form that lies in the space between long narrative magazine articles and traditional books and e-books”. See also: Long-form journalism finds a home (New York Times). The case of lawyer Charles Richardson, who has been charged with libelling a police detective in a status update on his Facebook page, has reopened the debate about whether what you post on social media sites can or should land you in a lot of legal trouble. The short answer is, of course it can, as a lengthening list of high-profile Twitter and Facebook cases illustrates. I’ve long made the point to fellow users that if you post something on a blog or your Facebook page, you are effectively publishing and are subject to the same laws of libel as any traditional media. Freedom of expression should not come without responsibility. James Whittaker and Sirkka Huish did a good job in today’s Bermuda Sun highlighting the pitfalls and potential risks for local social media users in light of the Richardson case. I urge you to read it – and show it your kids, many of whom either seem to be oblivious to the personal damage their posts can cause or the fact that they are accountable for what they write and, in an extreme case, end up being taken to court. The legal debate is growing ever complex as it grapples with jurisdictional issues thrown up by the internet, whether Facebook and Twitter should be held liable for the content of their sites in the same way that newspapers are, and whether the law can even keep up with the pace of emerging technology.